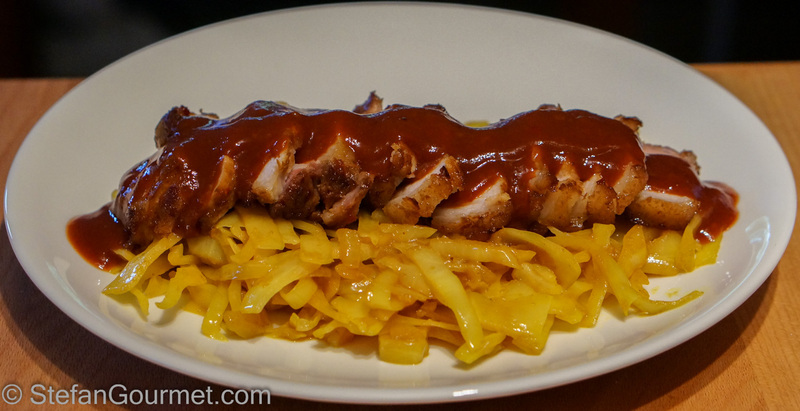 The Dutch version of Babi Pangang is roasted pork (or boiled pork that is then deep fried or grilled), either pork belly or pork shoulder, with a sweet and sour red sauce and atjar (sweet and sour cabbage with turmeric). 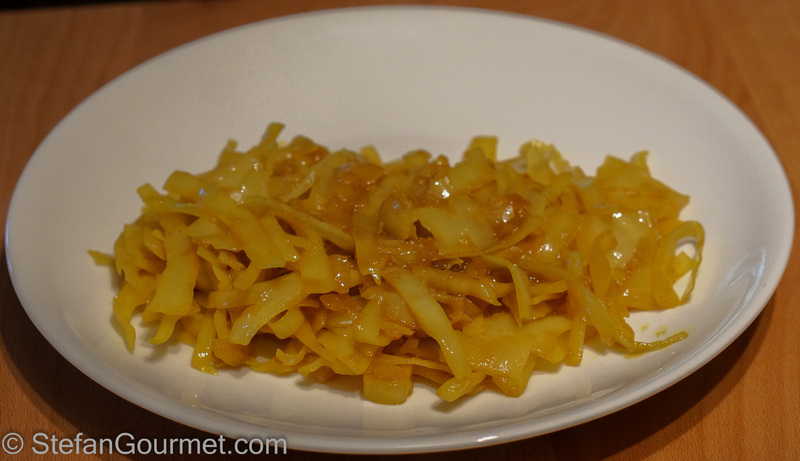 Compared to the typical restaurant version, the babi pangang in the picture has more of the cabbage (atjar) and less of the sauce. 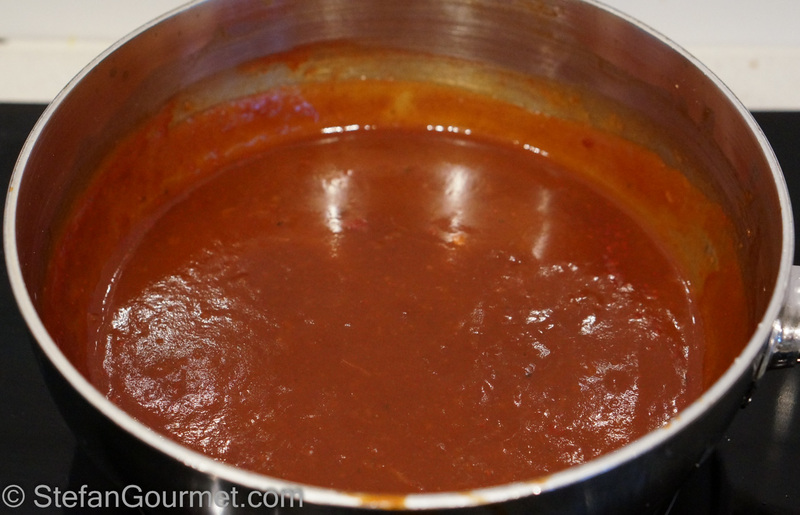 In the restaurant version, the meat is completely drowned in the sauce. I put less sauce on it for the picture, so you could actually see the meat. I used more cabbage simply because it’s healthier. Babi Pangang is very nice if you like sweet and sour. 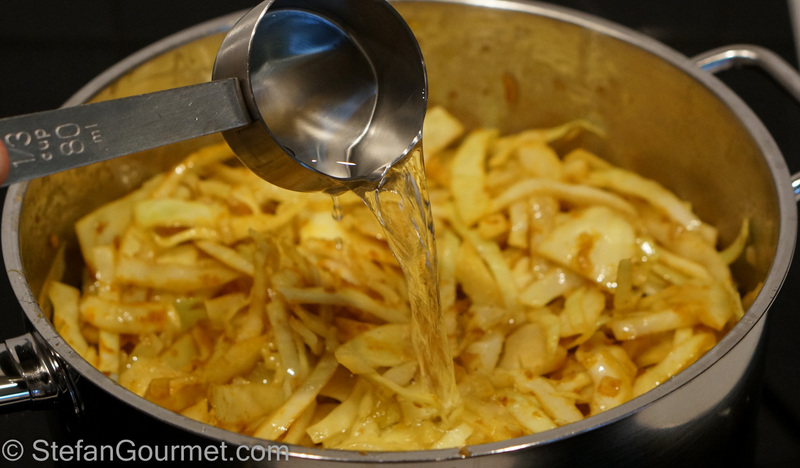 It is quite easy to make, it is mostly a matter of measuring out and mixing ingredients. 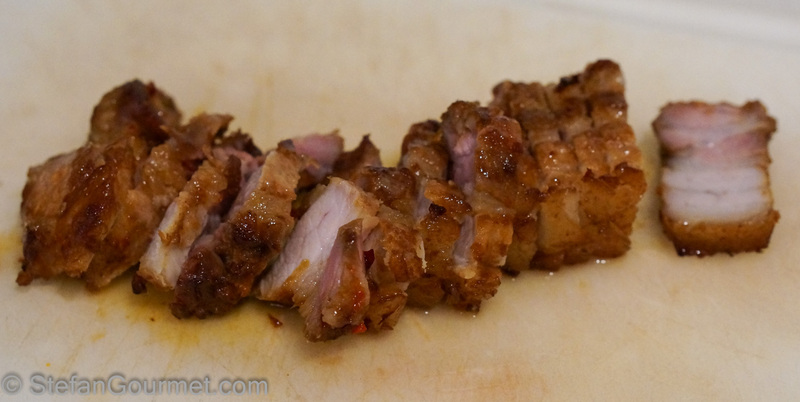 The only tricky part is making sure the meat is both crispy and juicy. This time around I roasted it in the oven, but next time I will use sous-vide again to pre-cook the meat to keep the meat more juicy. 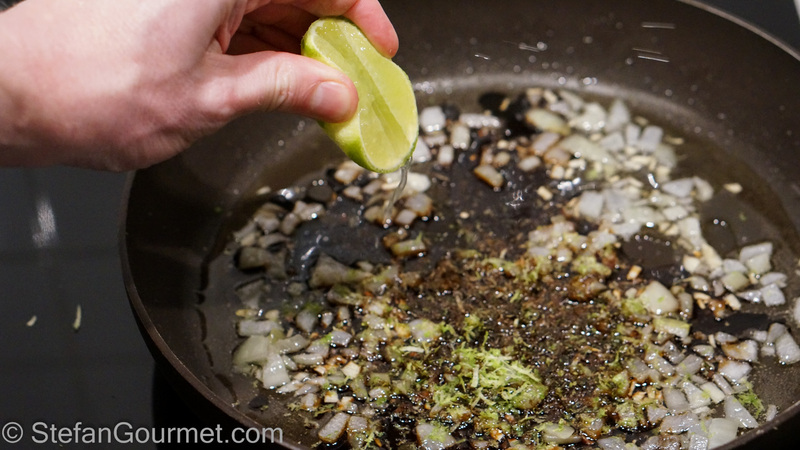 I used this recipe (in Dutch) as a basis for my version. 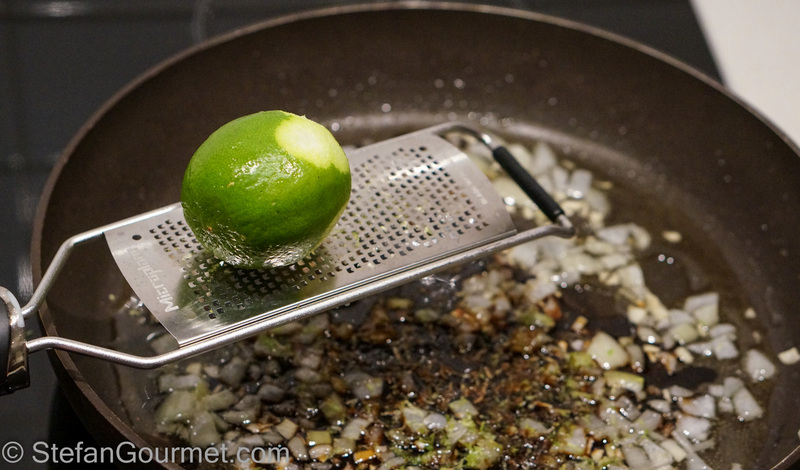 To make the marinade, sauté the onion and garlic in the oil over medium heat until the onion is soft and fragrant, about 5 minutes. 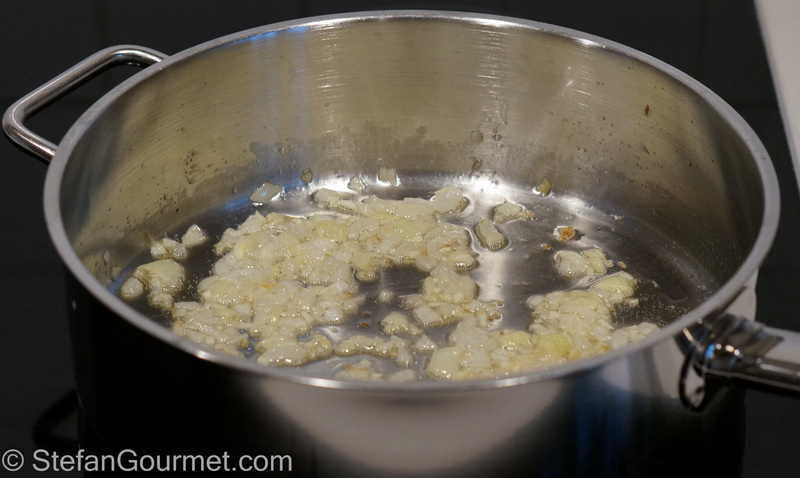 Stir and bring to a boil. Turn off the heat and allow to cool to room temperature. 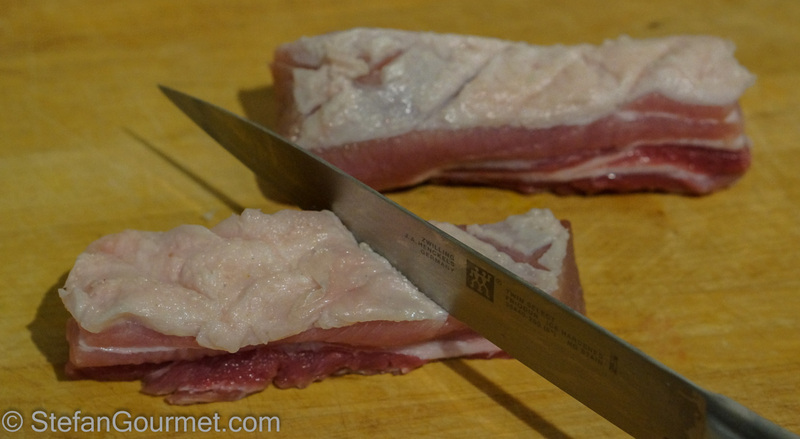 Cut the pork into thick (3 cm or 1 inch) slices. Score the meat in a diamon pattern. 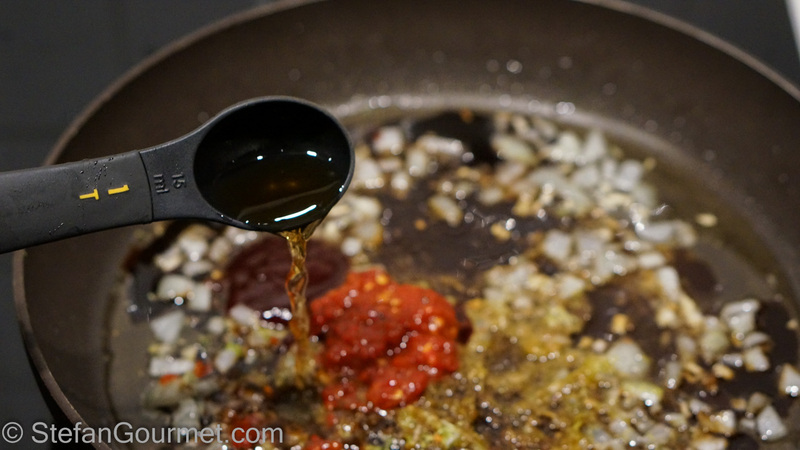 Rub the marinade into the meat and allow to marinate for at least 2 hours or overnight. 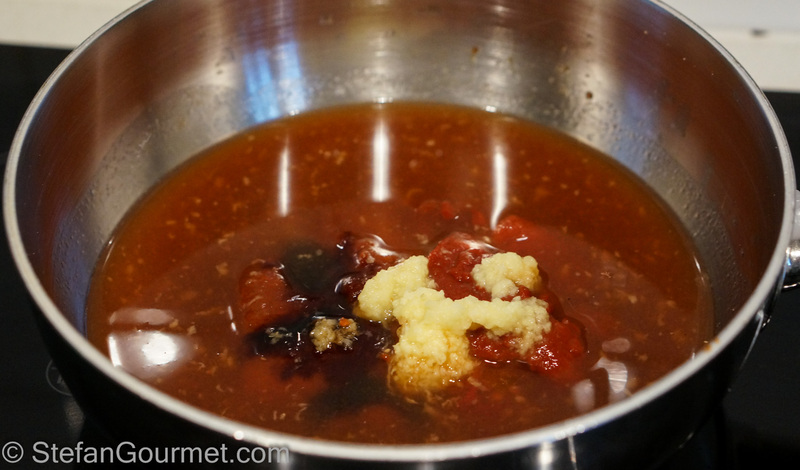 Preheat the oven to 180ºC/350ºF. 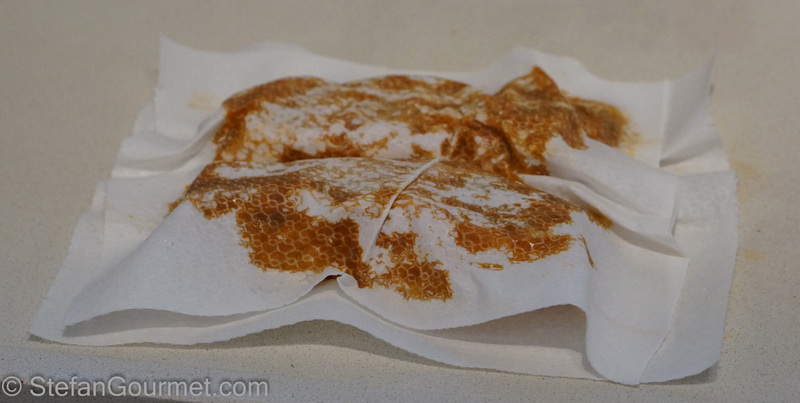 Pat the pork dry with paper towels. 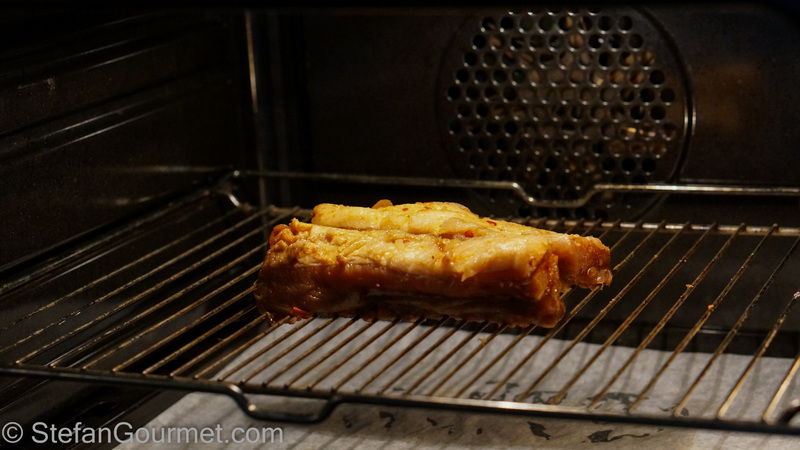 Put the pork on a grill with a baking sheet lined with aluminum foil or parchment paper underneath to catch the drippings. Roast for about 20 minutes or until nicely browned and cooked through. 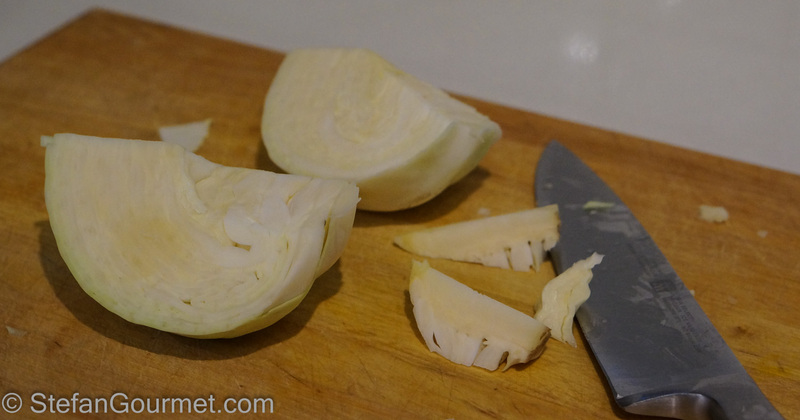 Cut the cabbage into quarters and remove the stem. 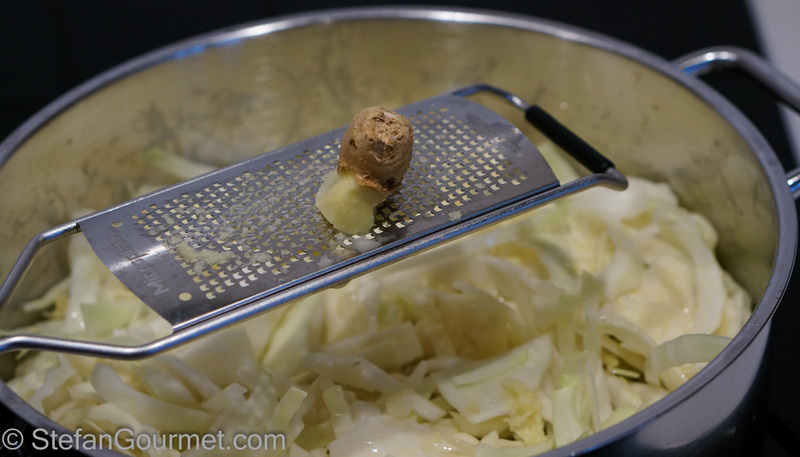 Shred the cabbage (which you should do more finely than I did). 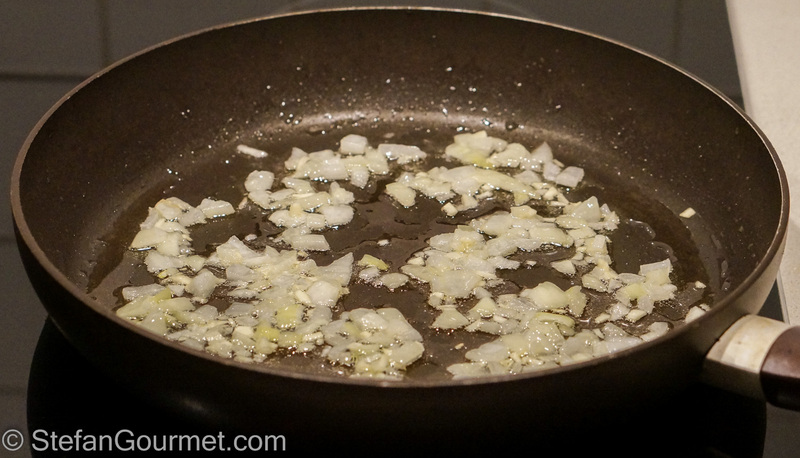 Sauté the onion and garlic in the vegetable oil over medium heat until soft and fragrant, about 5 minutes. 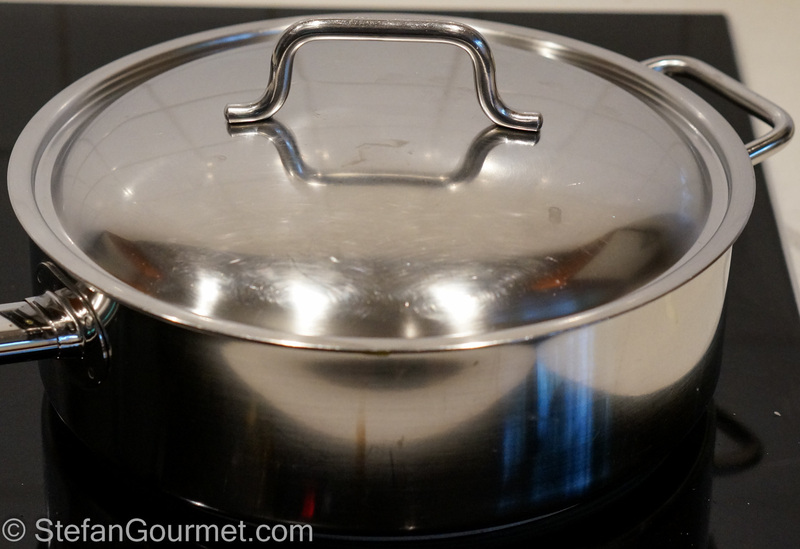 Cover and lower the heat. 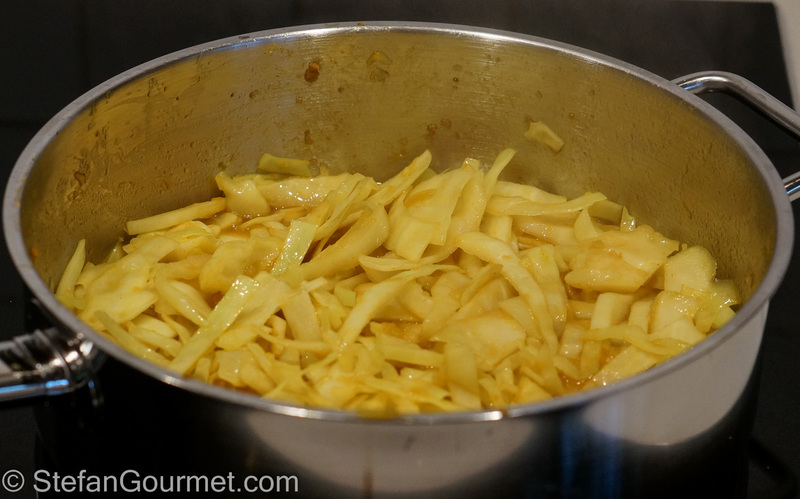 Simmer over low heat (barely boiling) until the cabbage is tender but still firm to the bite, about 30 minutes. 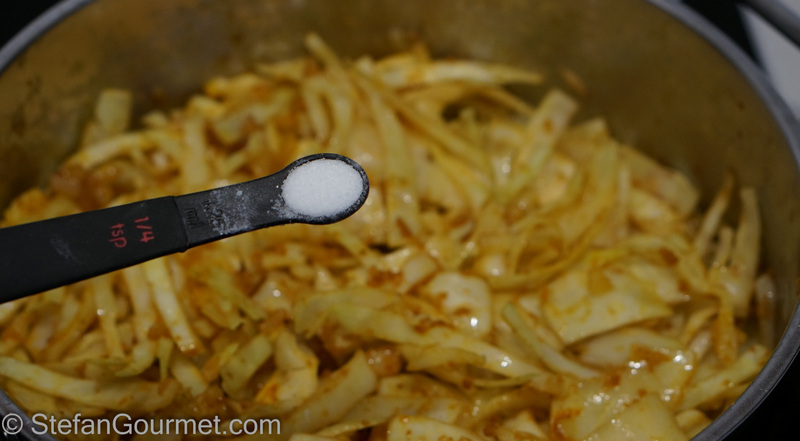 Taste whether the cabbage is tender and correctly seasoned. 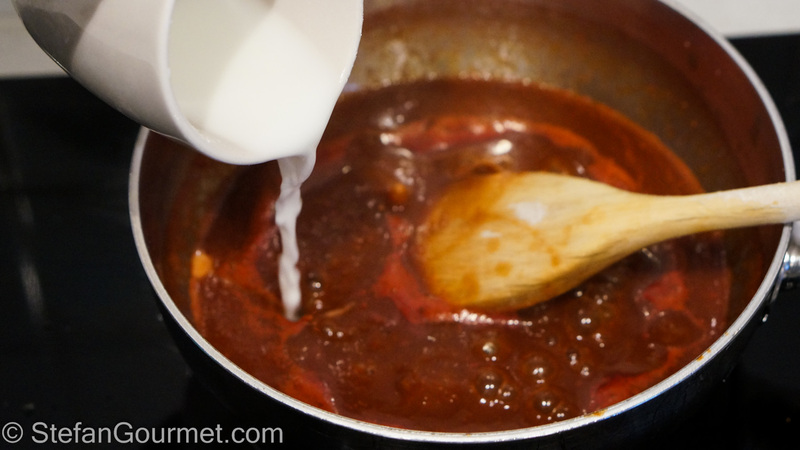 Mix the corn starch with a bit of cold water, and add the mixture to the sauce. 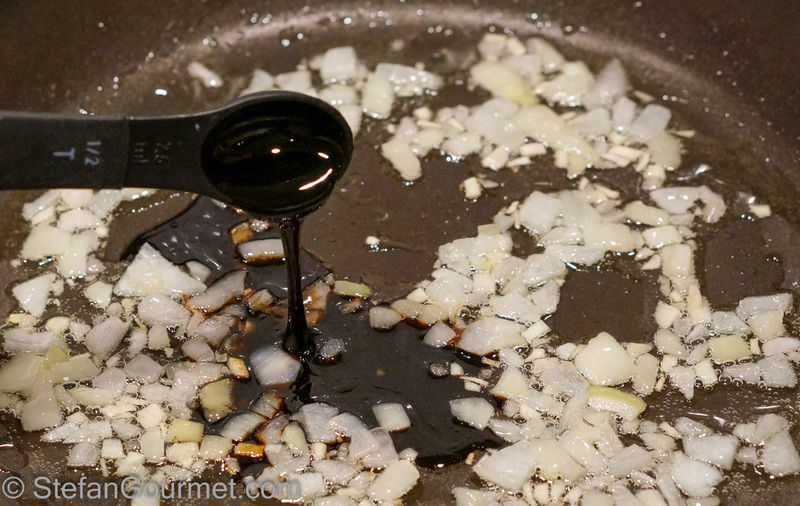 Stir for another minute until the sauce has a slightly thick consistency. 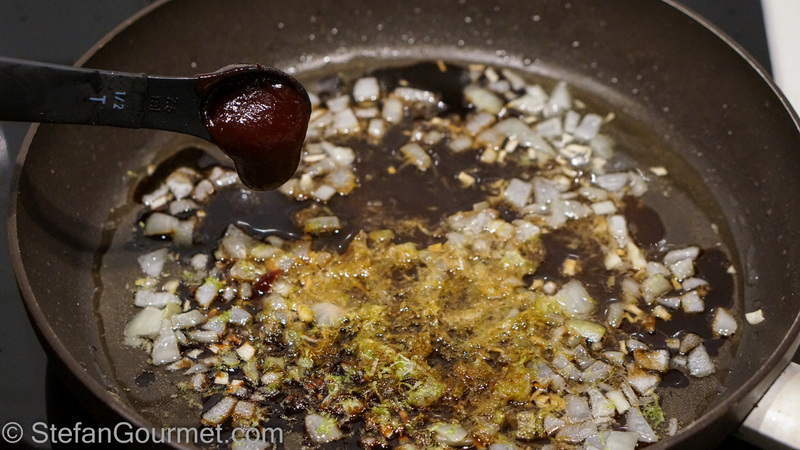 Add more corn starch mixed with water if you like the sauce thicker. 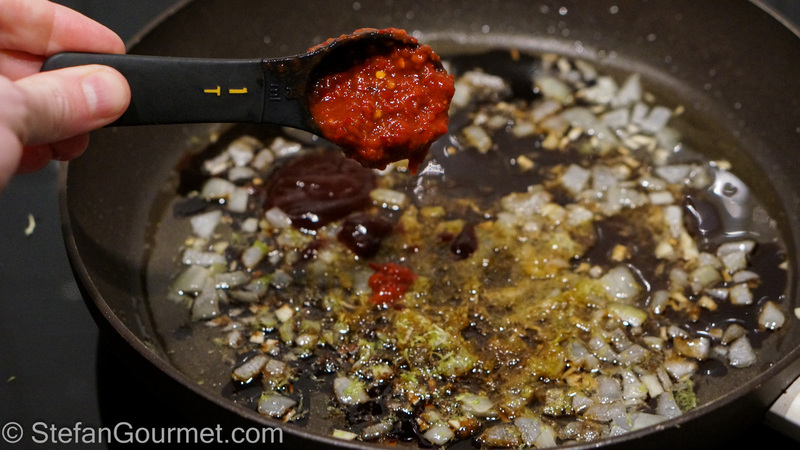 Taste and adjust the flavor to your liking with sambal oelek, vinegar, salt, sambal oelek, ginger, or ketjap manis. 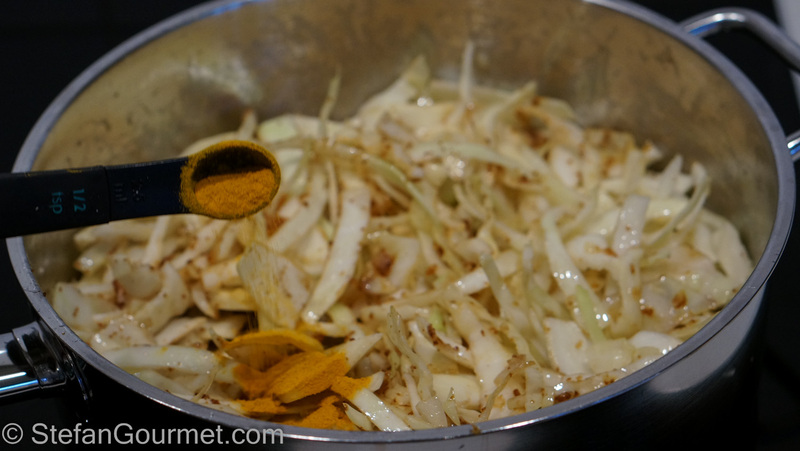 Start with a base of the cabbage. 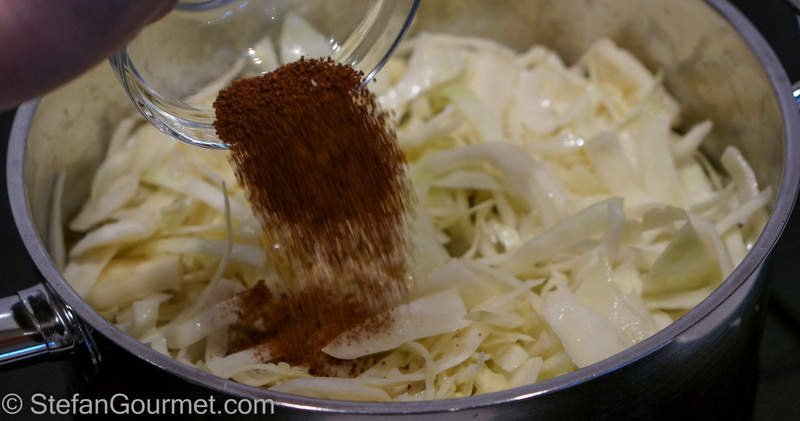 …and arrange the sliced meat on top of the cabbage. 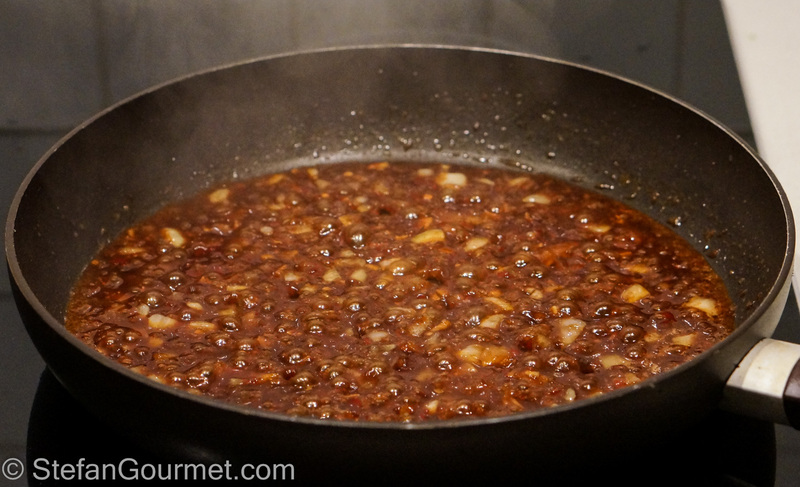 Cover with the sauce and serve with rice. This requires a hefty white that can handle the sweet and sour, such as a Mosel Riesling (Auslese or Spätlese, Halbtrocken/Feinherb) or a Gewürztraminer from Alto Adige or Alsace. 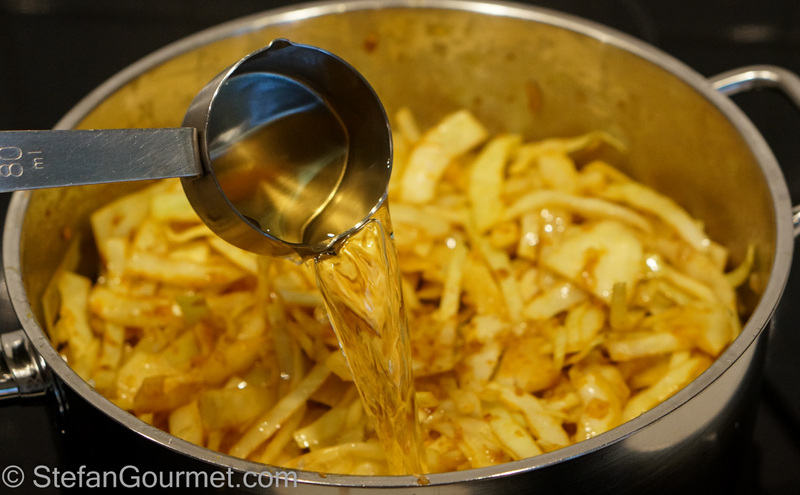 Two years ago I also prepared something with ginger, but quite different and more refined. This Japanese chicken loaf with eggplant and ginger is very original and delicious. This looks so good, regardless of it’s authenticity. 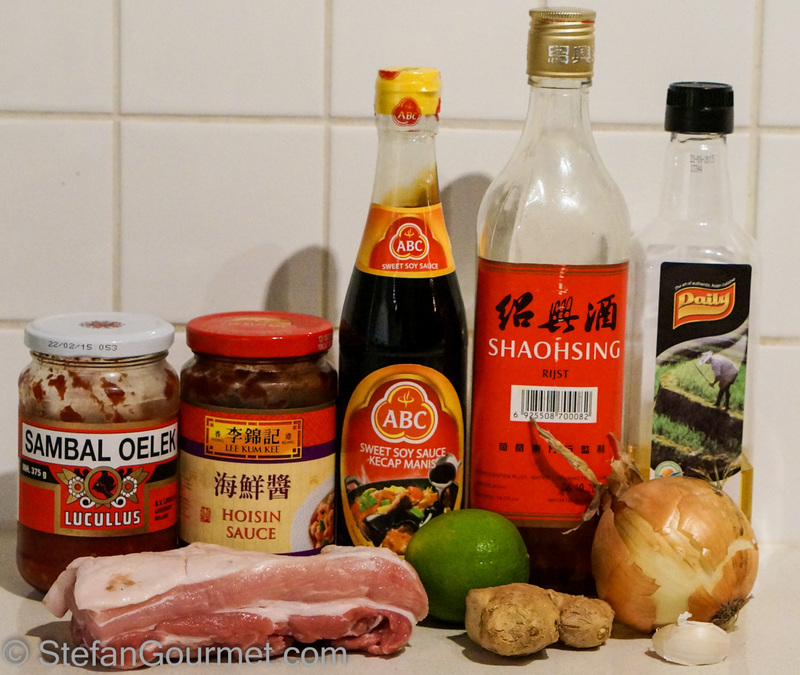 Sweet and Sour pork is possibly the most popular “Chinese” dish in New Zealand too. As a New Zealander with Chinese ethnicity, I always giggle when my husband orders sweet and sour pork but I’ll chow down on it too. This looks amazing Stefan! You are honestly ‘just something else’!! Hey – any plans for spending another holiday on that boat where you did all that amazing cooking? Fabulous, Stefan! Absolutely fabulous! 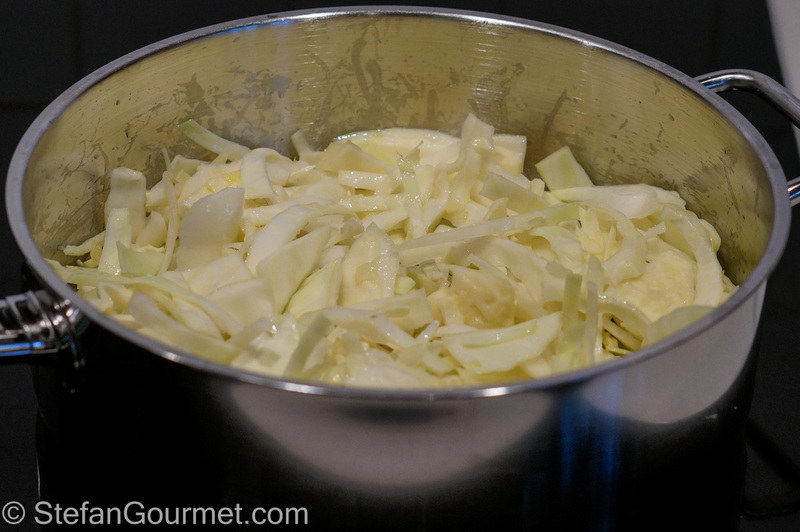 And I have not prepped cabbage quite like that!! Actually a tad ‘fusion’ in the area, with which I love to experiment . . . have not used shaoshing as far south as Indonesia or had hoisin together with ketjap manis too many times [and the latter is usually the first for which I’ll reach 🙂 !] Want to copy it exactly as you truly have made a very welcome journey to ‘our’ world !!!!! 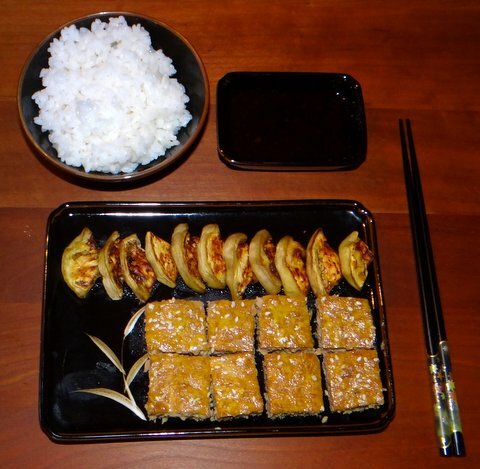 It is so interesting to read the food blogs of another country’s cooking! It’s always surprising to me. I’m always looking forward to see what is next. Lovely method Stefan and a pretty perfect walk-through. My kind of food. It’s been too long since I’ve had Indonesian food and I really miss it. 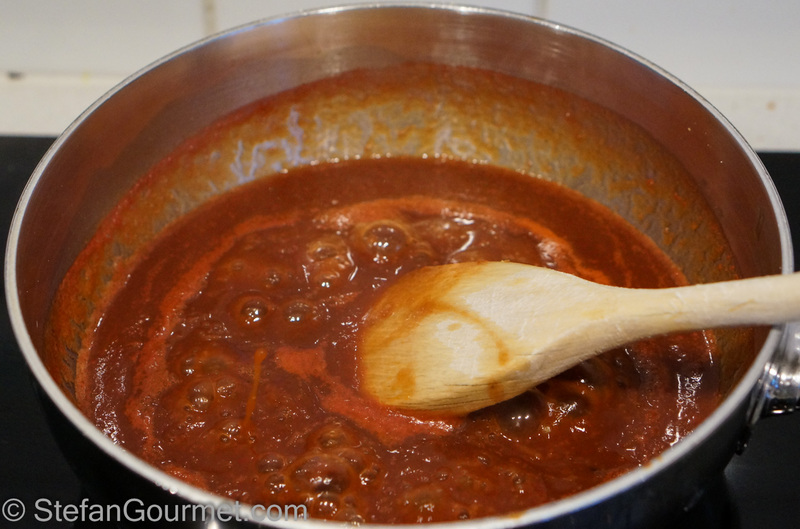 Thanks for the recipe… I think soon your dish will be on my table. Wish I could enjoy this for lunch today, Stefan! And I know what you mean about taking and dealing with so many photos! It gets so tedious at times!!! This looks amazing. Definitely better than any restaurant. So much flavor and healthful ingredients. Your photos are great. 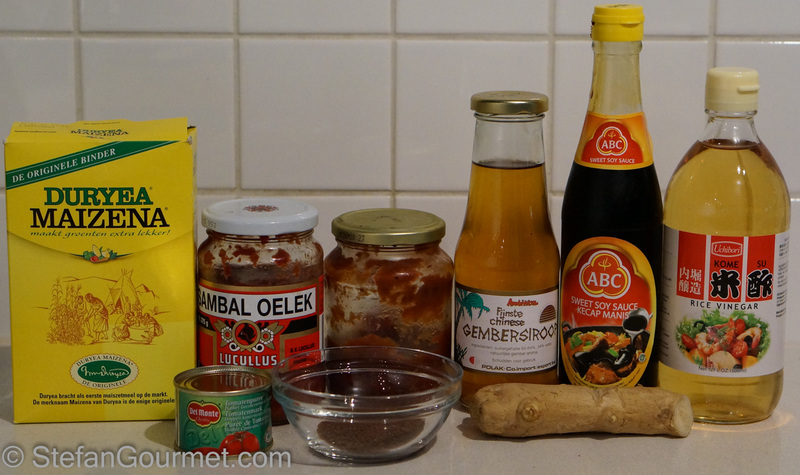 Actually I’m so happy seeing “Kecap manis ABC” in your pictures because I’m Indonesian 🙂 I’ll try this recipe with chicken instead… Hope it’ll turn out great! Hi Vanessa, thanks for visitings. I’ve heard that ABC is the leading brand in Indonesia, that’s why I chose to buy it.